Scott McAlpine comes into homeplate after hitting a homerun in the sixth inning. His teammates greet him with congratulations. 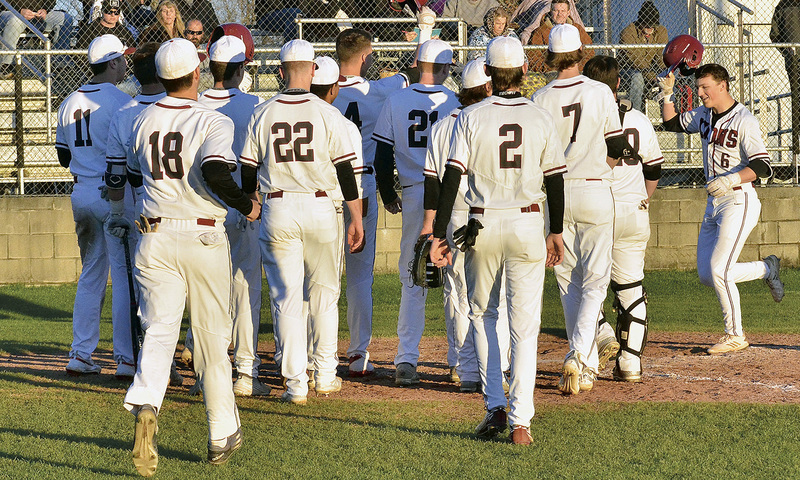 HALEYVILLE - The Haleyville Lions dropped a double header Friday, March 15, by the slimmest of margins to the Jasper Vikings. HHS lost 3-2 in the first game and 4-3 in the second. Ben Lowman started the first game for Haleyville, recording nine outs. He took the loss. Lowman lasted three innings, allowing three hits and two runs while striking out three. John Whiteside finished the last four innings, with three strikeouts. Tyler Thomasson was credited with the victory for Jasper. Blake Bennett and Scott McAlpine socked two home runs in the sixth inning. Bennett, John Miller Lawson, Morgan Long, Jackson Kennedy and Mc-Alpine all had one hit to lead the Lions. The Lions lost the lead late in the second game to lose 4-3. Haleyville put up three runs in the third inning. Marchant, Lowman and Morgan Long each drove in runs during the inning. Seth Davidson earned the victory on the pitcher's mound for Jasper. Brantson Lambert took the loss. He lasted five and a third innings, allowing seven hits and three runs while striking out eight. Lowman, Bennett, Long, Whiteside, Mar-chant and McAlpine each collected one hit to lead Haleyville.